@ChrisW what is a real actual measured weight for a .260 or 6.5CM Finnlight 2 or just the S action Finnlight2 stock? That’s pretty similar to my 260 Finnlight I, 3.1 kg including bolt, empty mag and 30mm optilocks (no scope). Optilocks were 140g iirc so would be 2.96 kg without them. I like the idea of the adjustable comb on the II. Yes the stock is much stiffer than the original Finnlight & has the adjustable cheek piece. Its not significantly lighter, but its a much better stock, imo. Finnlight II are also available in Left handed actions. This is somewhat appealing from Sako. Not many high quality factory stainless synthetic rifles out there for us Southpaws. Nice rifle. How’s it shoot? Dammnnnn Son! That's a lovely setup right there. Shoots like a 85 should although still early days to really give a critical review. Fits like a glove in the shoulder, we’ll balenced and the adjustable comb is actually more useful than I thought. The rubber grippy things are good and more solid than the finnlight I grippy things. My only real annoyance is that the bolt handle isn’t Cerakoted which is an oversight in the design, although easily fixed. I’ve got a sako carbonlight in 260. 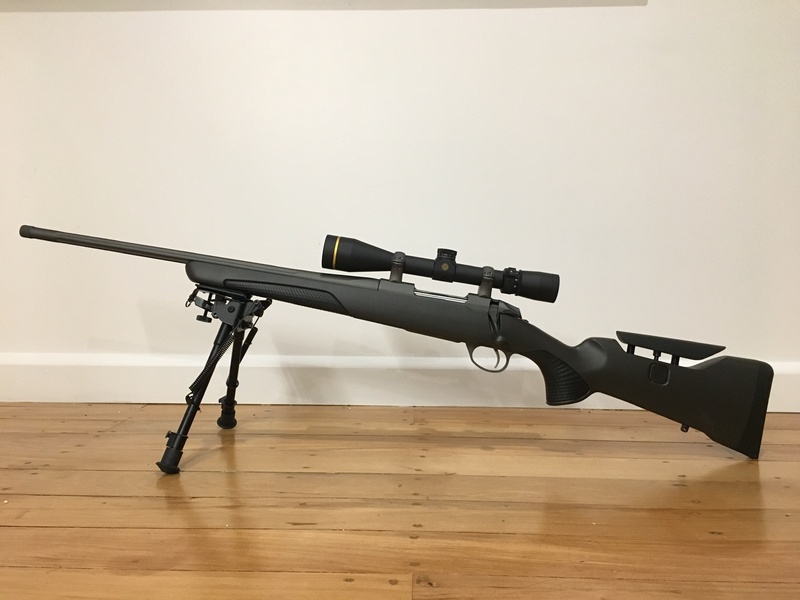 It’s shoots real well and has a 3.5-10x40 vx3i cds on it. 7lbs suppressed. The finnlight 2 with the cheek piece looks the bizzo for sure. Does anyone else have a Finnlight II and would care to share their impressions of it? I have one in 300wsm with a set trigger. It is a fantastic gun and shoots bloody well. (needed to as i dropped back from a Blaser) Balance is good and the finish of the cerakote is great. Im not sold on the new grips, but the cheek piece is comfortable and well designed. Accuracy: Its an 85 and shoots like an 85 should. Finish: Cerakote is real nice, only time will tell on its robustness. HOWEVER, Sako didn't Cerakote the bolt handle AND the bolt body is not stainless. This is a let down for a rifle advertised as the ducks nuts for all weather. Easy job to Cerakote the bolt handle but cant do anything about the bolt body. Shame on you Sako for that oversight, now I gotta make sure that bolt doesn't rust on extended hunts which is a pain. I will also need to Cerakote the button that moves the adjustable stock piece as its rusted. Stock: Its stiff as fuk with the carbon fiber bedding which has to be a good thing. I like the rubber grippy things, real sticky even when wet and appear to be more robust than the Finn I grippy things. Fibreglass component of the stock does scratch quite easily. For me I dont care, its a tool, not a show piece. The adjustable stock is real nice and I do use it. It has no play in it at all which is nice. Balance: Spot on for me with a VX3 mounted on it. Cool factor: looks pretty sweet I reckon. Overall: Awesome rifle but let down on the weather proofing of the bolt. Thanks guys, I'm considering buying one tomorrow. Plenty of rifles with a stainless bolt handle but didn't know there were rifles with a SS bolt body. Bought a Finnlight II in .308 today. Nice rifle. Philipo, gadgetman and ChrisW like this. I'm pretty sure the bolt body on my 85 SS is stainless. Never a spot of rust on it. The only rust I've seen is on bedding screws threads and under the optilocks. My stock fills up with water when used for a support pole river crossing then runs out through the action when held horizontally. Again, "shame sako". We note these minor problems critically in a constructive spirit because the overall package is so good and we "expect perfection" . Still it's better than almost every other rifle I see (including the fantastically engineered but too complex blaser in my opinion and also the older sako vixen for comparison). Thanks for the comments on the adjustable cheek piece. That's an imperfexion in my 85SS.